In this years edition of Google Summer of Code, an international annual program in which stipends are awarded to students to hack on Free Software during the summer, openSUSE members are mentoring seven students who all passed their mid-term evaluation last week. Go on to read what they have to say about their first 10 weeks in the program. This year, we have three students working on the Open Source Event Manager (OSEM), which is a Ruby on Rails application that is used to organize openSUSE conferences. One of these three students is Ana Maria from Madrid. Her project is to improve the conference schedule to make it more functional and mobile friendly. In her midterm blog post, she shows and explains how she reimplemented the schedule within a bootstrap carousel. One of the best things of working at openSUSE is that I have the chance to work with a lot of intelligent people that come up with amazing ideas. Visit her awesome blog to read more about her experience. The second student working on OSEM is Rishabh Saxena from India. Rishabh works on an online payment feature for Conference tickets. He is integrating active merchant, which is a simple payment abstraction library, in to OSEM. He writes about the challenging but rewarding code review process and visiting the openSUSE Conference in Nuremberg on his mid-term blog. Although Nishanth Vijayan`s project is under the FOSDEM organization, he is the third student working on OSEM this year. 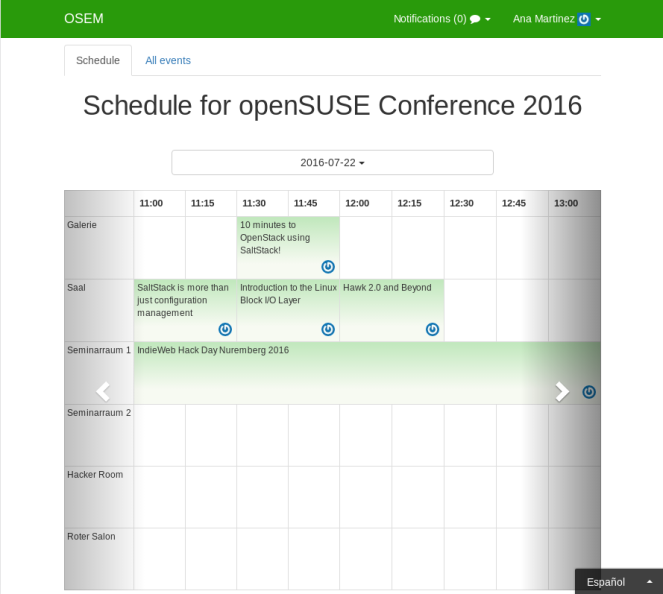 While OSEM is an openSUSE project, FOSDEM wants to improve and extend OSEM for a more general use. This is a fine example of collaboration between open-source organizations. The goal is to implement a Revision History page so that organizers and admins are aware of all changes made to the data. In his blog, he describes the reasoning behind the project and explains several implementation details and decisions. Matheus Fernandes is a student from Brazil’s capital Brasília and this summer he works on “Improving the UI of Portus.” So far, Matheus already fixed many issues in Portus’ user interface. In his personal blog, he also reports about some difficulties he encountered while improving Portus tables and search filter. Joaquín Yeray is from the most beautiful island of Gran Canaria and works on an alternative YaST Module to manage update-alternatives in openSUSE. In his blog article, he describes the development process he uses together with his mentors Ancor and Josef. This includes daily meetings and developing a UI mockup and requesting early feedback from users. Implementation details and consideration are also a part of his blog article, which you can read here. Another Spanish student, Martin Garcia from Barcelona works on Jangouts, which is the open source video conferencing alternative. Almost every week, Martin releases a new blog article, which makes him our most active GSoC blogger this year. To cite his mentor Ancor: “It’s great that he blogs so often because it’s easy for us mentors to follow what is going on and I’m also learning new things about Java Script and AngularJS every week”. Ancor highlights again how important blogging in an open source environment is. Read more about Martin and his next steps in GSoC on his blog. Shalom is not only a programmer, he is also an enthusiastic musician from India. Originally from India, he plans to move to Edinburgh for his Master of Science studies in September. At openSUSE, he works on the improvement of the Once Click Installer, which includes for instance the port to Qt5, improving localization or replacing direct zypper executions with library calls. By the midterm evaluation, he already committed 1,307 Lines of Code in 33 commits. If you want to get more details about this project, check out his blog. Thanks to the openSUSE Travel Support Program, which supports contributors with their travel and hotel costs, we were able to bring four GSoC students (Joaquín, Rishabh, Ana and Matheus, from left to right in the picture above) and all mentors to the openSUSE Conference in Nuremberg. Meanwhile, all students published interesting blog articles about how their experience went at their first tech conference. Ana wrote blog articles about every single day of the Conference and even extended her stay for the openSUSE Hackweek. First Rishabh had concerns reaching Nuremberg from India alone, but now he references it as one the best experience ever in his life. The most important part of the conference for Joaquín was not the talks or workshops. For him, it was meeting all the openSUSE contributors in person. And finally, Matheus reports how beautiful Nuremberg is and it reminds him of living in an “Age of Empires” game. The opportunity to have most GSoC participants together at the conference was just too good, so we decided to have a short meetup. We met on Friday morning in the Beer garden, almost all GSoC mentors and the four students were able to attend. We discussed several topics at our meetup like blogging and collaboration in general. One of the most interesting discussions was how the students get to know about openSUSE and why they finally chose us. You can read the full meeting minutes on the opensuse-project mailing list. Last but not least, we would like to thank everyone involved (mentors, students, board, TSP etc.) in this year’s Google Summer of Code – together we really make a difference!